Up to £4 billion of value is currently ‘hidden’ in the waste generated by the food and beverage, pharmaceutical and manufacturing industries, and could be extracted with better reuse, recycling and remanufacturing, says Veolia. A new report, Imagine 2050, published yesterday (2 November) by the waste management firm, which follows on from a 2014 report of the same name, highlights innovative business models it says are needed in the three sectors to meet resource and waste challenges by 2050. Thirty-four per cent of the European population will be aged 60 or over in 2050 , according to estimates from the United Nations. Veolia’s report highlights the challenges of population growth and the pressures to reduce carbon emissions, as well as methods of utilising technology advances, and the ways these shape resource-use in manufacturing, food and pharmaceuticals. The 24-page report reveals how business models can be redesigned by 2050 so that products and remanufacturing processes operate with a closed loop. It also suggests that by generating energy from renewable sources and treating water as a valuable resource rather than a cheap commodity, businesses will become more self-sufficient. Veolia claims that by imposing such circular approaches, the 130-million tonne ‘waste mine’ currently created by the manufacturing, pharmaceutical and food sectors could generate £4 billion of value. Launching the report at an event in London yesterday, Senior Executive Estelle Branchlianoff said: “Realising this value has a double windfall – it helps businesses manage their resources more efficiently, and generates new revenue streams. As part of the vision, Veolia has highlighted priority changes and innovations for each sector, as well as looking at the ‘megatrends’, such as population growth and advancing technology, that will affect every industry and dictate its development. Food production cost pressures will bring about major changes across the food and beverage sector, with companies needing to reimagine the by-products currently thrown away with around £460 million of unutilised resources. Veolia says that new technology will enable better use of energy for the sector and help minimise costs, while biomass combustion technology and anaerobic digestion processes can produce energy to power factories and homes. Progress could also be made through changing habits, and how they are catered for. According to the UN, 30 per cent of the world’s population already eat insects as part of their diet, and the Economist estimates that a cow requires eight kilogrammes (kg) of feed to produce 1kg of beef, but that only 40 per cent of the cow can be eaten, whereas crickets require just 1.7kg of food to produce 1kg of meat, and 80 per cent is considered edible. With the meat industry accounting for 18 per cent of our total greenhouse gas emissions, lab-grown meats and insects might come to play a greater role in our diets. The report suggests that data and advances in precision farming mean that it’s increasingly possible to grow, cultivate and produce products that are unique to individual customers, enabling the creation of bespoke nutrition. This would therefore have an impact on the 30–50 per cent of all food currently produced that is lost before reaching a human mouth, according to the Institution of Mechanical Engineers. What does it mean for manufacturing? According to Veolia, manufacturing businesses could benefit from £2.8 billion of hidden value in unutilised waste by generating, using and recovering energy and water resources and being closer to raw materials needed for secure supply chains. By 2050, the report envisions that waste materials will be turned into tradable commodities, potentially enabling 100 per cent recovery rates. Furthermore, nanotechnology and 3D printing will be embedded into supply chains, enabling flexibility with production and more efficient use of resources. Research will lead to more lightweight yet durable materials, providing manufacturers with structures using less material and energy. 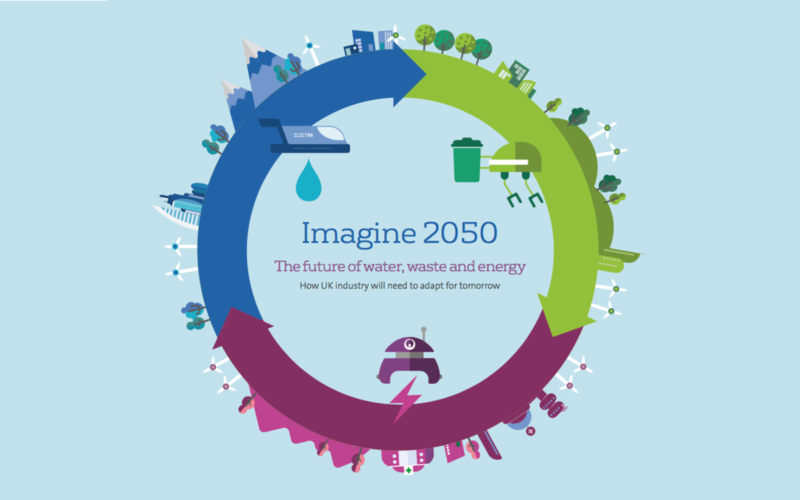 Veolia’s ‘Imagine 2050’ report can be downloaded from the company’s website. Coca-Cola European Partners has announced a solar farm and a commitment to getting 100 per cent of its electricity from renewable sources as it advances sustainability in its UK operations.